Alcohol and Blood Pressure: What Are the Effects? Home » Heart Health » Blood Pressure » Alcohol and Blood Pressure: What Are the Effects? The relationship between the long-term use of alcohol and blood pressure levels is a major medical concern as alcoholic drinks are commonly consumed by most cultures in the world, and one in eight American adults (12.7%) suffer from alcohol abuse. Chronic alcohol consumption can have damaging effects on the liver, digestive tract, and vascular system, which leads to elevated blood pressure levels. This increases the risk for serious cardiovascular issues, like heart attack and stroke. The link between alcohol and blood pressure levels was first documented in the early 1900s. Dozens of studies since then have worked to establish the physiological mechanism behind the relationship, and research is still ongoing. Can You Drink Alcohol with Blood Pressure Medicine? Can Withdrawal from Alcohol Cause High Blood Pressure? Numerous studies on high blood pressure and its risk factors have revealed a close link between the disease and alcohol consumption. While consuming more than three drinks at one time causes a temporary rise in blood pressure, chronic binge drinking appears to result in long-term spikes. Researchers believe that blood pressure rises by about 1 mm Hg (millimeter of mercury) per every 10 grams of alcohol consumed. Two to four weeks of abstinence will return levels to normal. However, the question, “How does alcohol increase blood pressure?” has yet to be answered with scientific certainty. A comprehensive review published in the World Journal of Cardiology in 2014 attempted to show cause. Possible contributing factors include a disruption of the central nervous system; a malfunction of the baroreceptors, which regulate blood pressure; overactivity of the sympathetic nervous system; acceleration of the renin-angiotensin system; heightened cortisol levels; a rise in vascular activity; and inflammation and oxidative stress within the blood vessel walls. Blood pressure levels may rise as alcohol stimulates a joint reaction of the central nervous system and the peripheral nervous system. The substance can also increase blood circulation as the stress-induced, corticotropin-releasing hormone is emitted. This may be seen during the alcohol withdrawal period, resulting in rising of the blood pressure. The baroreceptors recognize changes in blood pressure within the blood vessels and attempt to balance the circulation flow. Alcohol has been shown to impair the sensitivity of the baroreceptors. Alcohol may raise blood pressure as it boosts the sympathetic nervous system to release sympathetic amines. This can include stimulating the release of the hormone adrenaline, which speeds up the heart rate and blood pressure levels. The renin-angiotensin system plays a major role in blood pressure and fluid level regulation. An alcohol-high blood pressure issue may be caused by alcohol consumption triggering an increase in plasma renin activity. The overactivity of the renin enzyme stimulates production of angiotensin II, known as AII. This hormone has a constricting effect on the blood vessels, causing them to narrow. It also encourages the adrenal gland to release aldosterone, which raises the fluid and sodium content within the blood. Cortisol is one of the hormones released by the adrenal gland when the body is under physical or mental stress. This action can hinder metabolic processes while increasing blood pressure as blood vessels are constricted. Alcohol abuse raises cortisol levels, as the alcohol causes the pituitary gland to release the adrenocorticotropic hormone. In large quantities, this hormone forces the blood vessels to narrow, causing a rise in blood pressure. The cells within the inner linings of the blood vessels, known as endothelium cells, may be directly affected by levels of oxidative stress rising due to alcohol-induced blood pressure. As excessive alcohol consumption may cause inflammation of the endothelium cells, the blood vessels lose elasticity as constriction of the passages is stimulated. The production of nitric oxide, required by endothelium cells, may be reduced. Alcohol has been well studied in relation to high blood pressure, and while some clinical studies suggest that moderate consumption can be used to lower blood pressure, most experts recommend refraining from any alcohol use to maintain good overall health. In addition to an increased risk for cardiovascular issues, consuming more than three alcoholic drinks daily can increase the risk for high blood pressure by 70%. Cutting down on alcohol can be challenging for heavy drinkers, whereas those who drink socially may be able to avoid alcohol more easily. Hypertension patients who need to limit their alcohol should do so at a slow and steady pace. Reduce drinks over several weeks as blood pressure could rise significantly if heavy drinkers stop use abruptly. High blood pressure patients who do consume alcohol are advised to limit drinks in accordance to age and existing health condition. Moderation is key and can be defined as two alcoholic drinks daily for males under 65 years of age and one daily glass for older men. Women are advised to limit alcohol beverages to one per day at any age. One drink may be a 12-oz. glass of beer, a 5-oz. glass of wine, or a 1.5-oz. glass of spirits. Most prescription and over-the-counter medications come with a label warning against alcohol use. But how does alcohol affect blood pressure medication in particular? First, it is important to know that each hypertension drug works to lower levels in a unique way. Angiotensin-converting enzyme (ACE) inhibitors regulate blood pressure hormones. Angiotensin II receptor blockers, or ARBs, control blood pressure-related hormones, similarly to ACE inhibitors. Calcium channel blockers help the lining of the blood vessel walls expand, which sees a drop in blood pressure levels. Thiazide diuretics remove excess fluid to regulate the flow of blood. Certain high blood pressure cases may require a regimen of more than one of these medications. The use of alcohol may hinder the effectiveness of the drugs. Alcohol combined with the chemical properties of blood pressure medication may cause severe drowsiness, dizziness, headaches, and muscle weakness. Limiting or avoiding the use of alcohol in any amount can notably improve one’s health, as the risk for all cardiovascular conditions drop. Refraining from alcohol consumption is one way to address high blood pressure for some patients. This method can produce alcohol withdrawal syndrome (AWS) symptoms, which include a rise in blood pressure. While it is a temporary symptom, the sudden increase in blood pressure can be accompanied by other symptoms. Those who consume excessive amounts of alcohol may see a decrease in blood pressure levels after the short-term spike, according to one study. The study focused on patients’ blood pressure levels after a period of 48 hours without alcohol consumption. The participants with a temporary rise in blood pressure saw mild to severe symptoms including confusion, seizures, high fever, and hallucinations. These symptoms, along with a higher blood pressure reading, lasted for up to 12 days. Social media, and some doctors, promote red wine as a powerful tool in the fight against heart disease. In regard to lowering high blood pressure, a clinical study suggests non-alcoholic red wine may offer better results. As reported in Circulation Research, alcohol may hinder the function of the antioxidants, known as polyphenols, found in red wine. This antioxidant has been shown to decrease blood pressure levels. This study involved two control groups of men consuming alcoholic and non-alcoholic red wine. While the alcoholic beverage resulted in a small drop in blood pressure, the non-alcoholic drink produced a significant decrease in levels. The results suggest that the non-alcoholic red wine expanded the blood vessels to improve circulation by increasing the nitric oxide levels in the blood. This naturally produced gas is responsible for the relaxation of the blood vessels. While alcohol may have a profound effect on blood pressure levels, the results of long-term use will vary among individuals and depend on any existing health conditions they may have. Scientists believe that alcohol increases the force of blood against the artery walls due to its effects on the central nervous system, baroreceptors, sympathetic nervous system, renin-angiotensin system, stress hormones, and endothelial cells. The exact cause behind this is yet to be determined. Hypertension may be managed and reduced by following a healthy lifestyle, diet, and limiting alcohol intake. Does Drinking Water Lower Blood Pressure? Is Apple Cider Vinegar Good for High Blood Pressure? Husain, K., et al., “Alcohol-induced hypertension: Mechanism and Prevention,” World Journal of Cardiology, May 2014, 6(5):245-252; https://www.ncbi.nlm.nih.gov/pmc/articles/PMC4038773/, last accessed January 26, 2018. Sheps, S.G., MD, “Alcohol: Does it affect blood pressure?” Mayo Clinic; https://www.mayoclinic.org/diseases-conditions/high-blood-pressure/expert-answers/blood-pressure/faq-20058254, last accessed January 26, 2018. Puddey, I., et al., “Alcohol is bad for blood pressure,” Clinical and Experimental Pharmacology & Physiology, Sept. 2006, 33(9):847-52; https://www.ncbi.nlm.nih.gov/pubmed/16922819, last accessed January 26, 2018. 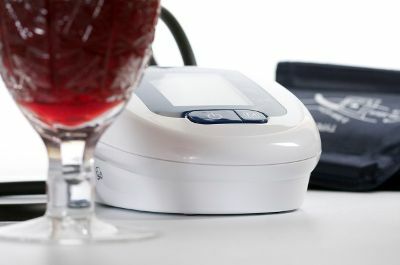 Draper, Dr. L., “How does alcohol affect blood pressure?” Superdrug Online Doctor; https://onlinedoctor.superdrug.com/high-blood-pressure-and-alcohol.html, last accessed January 26, 2018. Soardo, G., et al., “Effects of alcohol withdrawal on blood pressure in hypertensive heavy drinkers,” Journal of Hypertension, Aug. 2006, 24(8):1493-8; https://www.ncbi.nlm.nih.gov/pubmed/16877950, last accessed January 26, 2018. “Alcohol withdrawal syndrome”, Wikipedia; https://en.wikipedia.org/wiki/Alcohol_withdrawal_syndrome#Progression, last accessed January 26, 2018. Godman, H., “Non-alcoholic red wine may lower blood pressure,” Harvard Health Publishing Harvard Medical School, September 12, 2013; https://www.health.harvard.edu/blog/non-alcoholic-red-wine-may-lower-blood-pressure-201209125296, last accessed January 26, 2018. “Non-alcoholic red wine may help reduce high blood pressure,” Medical Xpress, September 6, 2012; https://medicalxpress.com/news/2012-09-non-alcoholic-red-wine-high-blood.html, last accessed January 26, 2018. Ingraham, C., “One in eight American adults is an alcoholic, study says,” The Washington Post, August 11, 2017; https://www.washingtonpost.com/news/wonk/wp/2017/08/11/study-one-in-eight-american-adults-are-alcoholics/?utm_term=.fa503be61219, last accessed January 26, 2018.